Bring the stock to the boil in a large pot. Reduce the heat and add rice. Keep covered and cook slowly until all the water is absorbed. Cool. Once cooled, add the remaining ingredients to the rice and mix well. Leave mixture in fridge for at least 30 minutes. 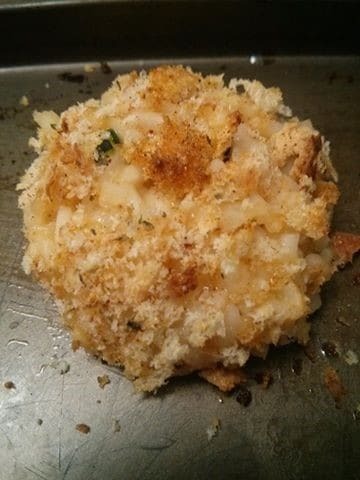 The mixture can now be formed into small balls and covered with panko crumbs and baked at 360°F for about 20 minutes (first picture), or otherwise pan fried in deep or shallow oil. 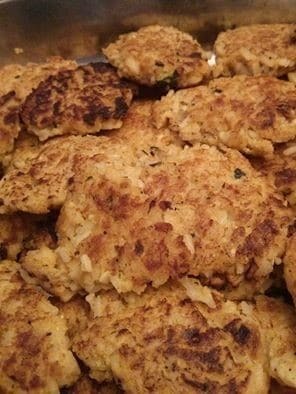 I formed ours into patties and lightly fried them in pan. Delicious served with an onion-&-tomato sauce!